The number of individuals with refractory glaucoma is increasing worldwide. Fortunately, so are the options to treat the disease. The XEN Gel Stent (Allergan) is a hydrophilic tube 6 mm long with an inner diameter of ≈ 45 µm that is placed in the subconjunctival space via an ab interno approach.1 The stent was specifically designed to effectively lower intraocular pressure (IOP) with reliability, predictability, fast recovery, and minimal tissue manipulation in refractory glaucoma patients.2,3 XEN is indicated for the management of refractory glaucomas, including cases where previous surgical treatment has failed or that are unresponsive to maximum medical therapy. The established safety profile of the device is an important consideration for many ophthalmologists and their patients. In the XEN pivotal trial, no subjects had surgical complications. Less than one-third of patients received postoperative needling. 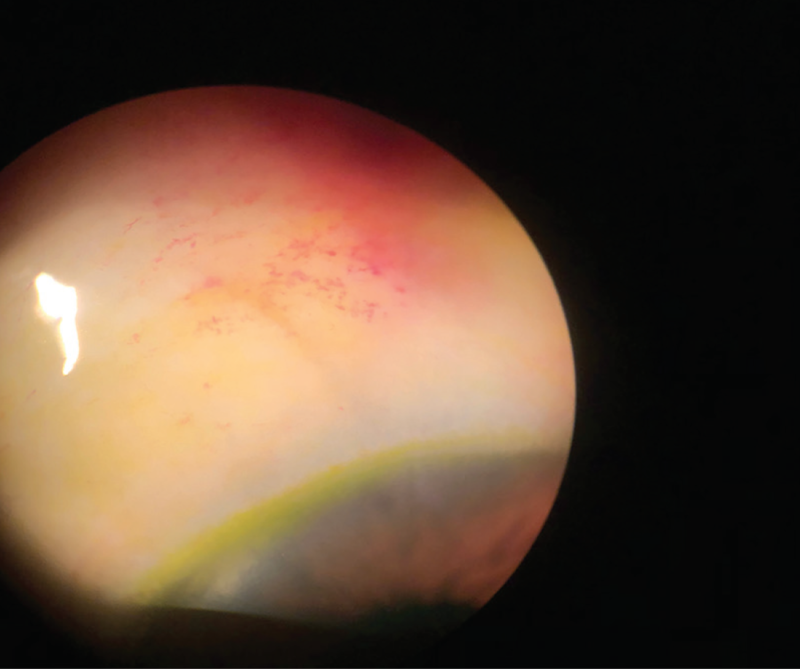 Several cornea, cataract, and glaucoma specialists who are treating their patients using the XEN stent recently gathered to discuss pearls for success with using the stent in pseudophakic patients and how to integrate it into your clinical practice. 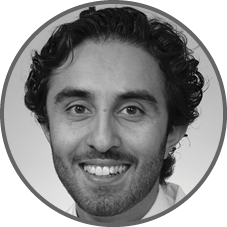 Arsham Sheybani, MD: Using the subconjunctival space to drain aqueous from the anterior chamber has been used for more than a century. While effective, it can also be seen as risky. However, the structure of the XEN Gel Stent is designed to control the flow of aqueous, and the ab interno surgical approach limits tissue disruption.4 How do these differentiated qualities play out in your experience with XEN (Figure 1)? Figure 1. Image showing the small size of the XEN 45 Gel Stent—about the size of an eyelash (A). The XEN Gel Stent becomes flexible and tissue conforming when hydrated. The 6-mm length and 45-μm inner lumen effectively controls outflow resistance at approximately 6 to 8 mm Hg, based on the Hagen-Poiseuille equation (B). David A. Goldman, MD: The XEN procedure is straightforward, manageable in the postoperative period, and provides excellent IOP lowering. This allows me to use it with a wide range of indicated patients. 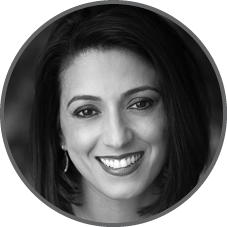 Neda Shamie, MD: I find XEN to be a minimally invasive way to shunt fluid away from the anterior chamber. It is a highly effective, reproducible procedure with minimal trauma to the conjunctiva and the ocular surface. Inder Paul Singh, MD: I find that XEN offers established safety, consistency, and predictability with effective IOP lowering. I’m very focused on reducing the use of IOP-lowering topical medications for my patients. If I have a patient with refractory glaucoma, I can use the XEN Gel Stent in phakic and pseudophakic patients and in patients undergoing cataract surgery. Because of this versatility of XEN, my use of it has really grown in my practice over the last 2 years. Dr. Sheybani: Dr. Shamie, you perform many different types of surgeries and are from an urban area with very demanding patients. How does the ab interno approach of the XEN stent fit in with patient expectations? Dr. Shamie: The ab interno approach to XEN placement is minimally invasive, and the results are predictable. As such, I feel that I am offering an effective option to my patients with refractory glaucoma. 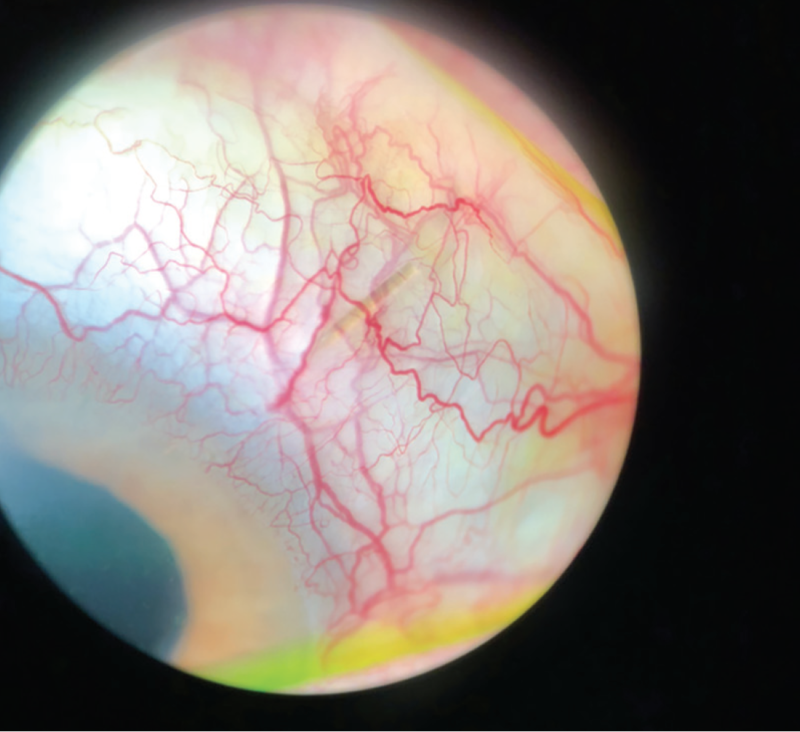 Dr. Sheybani: In my mind, this is such a differentiated procedure, and all ophthalmologists are at the same initial point on the learning curve. There is nothing specific that gives glaucoma surgeons an advantage when performing the XEN procedure, so all anterior segment surgeons should feel capable of taking on this procedure. Dr. Shamie: As a corneal surgeon, I am very comfortable working in the anterior chamber or the angle manipulating very fine tissue, as in the case of Descemet membrane endothelial keratoplasty. These skills transfer well to the XEN procedure, and this should be a great option for corneal surgeons. Cataract surgeons are also comfortable with depth perception of the anterior segment and manipulating microscopic instruments, such as capsular tension rings, skills which transfer well to this procedure. With a little patience and the commitment to add this to your surgical armamentarium, the learning curve is manageable. Dr. Sheybani: Let us consider the practical side of introducing a procedure new to the practice. If you have a high-volume, comanaged practice, how do you implement XEN? Dr. Shamie: A large majority of my patients are managed collaboratively by their primary eye care specialist. With XEN, I keep the patients for 1 month postoperatively, making sure that the bleb is functioning properly prior to sending them back to their referring doctor. As long as the comanaging doctor is informed of the timeline, there are no issues. I have also discovered that offering the XEN procedure differentiates me from other comanaging doctors who are not surgically treating refractory glaucoma. In addition, patients can be pseudophakic and still be a candidate1; this is an important consideration for me. Patients who had cataract surgery in our practice previously are now returning because they are uncontrolled on their glaucoma drops. Dr. Goldman: Although not a glaucoma specialist, I am confident treating my refractory glaucoma patients with XEN because of its established safety profile. From a practice standpoint, it has been very helpful. Dr. Shamie: I have a good relationship with the glaucoma specialists in my community, and they very strongly encouraged me to start offering this to my appropriate patients. There are so many refractory glaucoma patients that the glaucoma specialists cannot take care of all of them. I still rely very much on my glaucoma colleagues to manage complex patients in the long term. Dr. Sheybani: Is there anything else that needs to be completed logistically to offer XEN? Dr. Singh: First, it is necessary to make sure your facility is on board. Second, you need to check into what forms must be provided to your insurance providers. Allergan offers some assistance with XEN reimbursement and tapping into that was useful to me early on. In terms of comanaging, I do think one could comanage with outside providers. The key is helping to educate them ahead of time to know how to follow bleb morphology and know when to refer the patient back to the surgeon. Dr. Sheybani: XEN is one of the few interventional procedures that can be performed in conjunction with cataract surgery or as a stand-alone procedure.5 The FDA trial examined use of XEN as a stand-alone procedure; 15.4% of participants had no prior laser or incisional surgery, while 69.2% were pseudophakic.1 How does this influence which patients might be good candidates for XEN? Dr. Singh: My first 2 surgeries were very severe refractory glaucoma cases with previous tubes. Then, I began to implant a XEN stent into a number of patients’ eyes as their first glaucoma surgery; these were patients with healthy conjunctivas who were not responsive to their maximum tolerated medical therapy, many of whom were pseudophakic and thus not a candidate for MIGS. XEN is not ideally meant for patients who need an IOP in the single digits but rather for IOP targets in the lower to middle teens. It is for patients who were uncontrolled on their maximum tolerated medical therapy or whose previous surgery did not work. These are indicated patients on 3 or 4 IOP-lowering medications; they are great candidates for XEN. Dr. Goldman: One of my first patients was a woman from the Bahamas who came to me for cataract surgery; she also had refractory glaucoma. In my opinion, her IOP was inadequately controlled in spite of being on maximum medical therapy. This patient really needed to have IOP in the low teens. I discussed the options for surgical intervention with her, and I told her I felt that the XEN Gel Stent would be best suited to her. It should effectively lower her IOP and could be combined with her cataract surgery. Due to her being away from home for the surgery, I performed bilateral cataract/XEN procedures 1 week apart in each eye. I would not consider that approach with the majority of cataract/glaucoma procedures. I chose XEN for the established safety profile. Dr. Sheybani: The indication for XEN is patients with refractory glaucoma who are unresponsive to maximum tolerated medical therapy. What does this mean in the real world? Dr. Singh: My definition is any patient who has not been able to achieve their target IOP consistently with pharmaceutical drops. Dr. Sheybani: What are the specific characteristics that you look for that make a patient a good candidate for XEN when you are starting out with the procedure? What are the characteristics that you avoid? Dr. Shamie: For an absolute ideal first case, I would select a refractory glaucoma patient who is uncontrolled on at least 2 ocular hypotensive drops, who does not have ocular surface disease, who does not have keratinization of the lid margin, and who does not have a paper-thin conjunctiva or significant conjunctival scarring, which is a contraindication for XEN. Dr. Goldman: I find patients are more difficult to treat if they have narrow fissures, where you are not going to be able to visualize the conjunctiva as you are inserting the XEN Gen Stent. For the first few cases, I would choose a patient in whom you can really get the lid speculum in and open wide. I would choose a patient with a lower risk for postoperative scarring and no blepharitis, a contraindication for XEN, or other ocular surface disease that may also lead to bleb failure. Pseudophakic patients are really ideal. Dr. Singh: A closed angle is a contraindication for XEN. I would also avoid patients with a heavily fibrosed angle or peripheral anterior synechiae. The key is to create the optimal environment: healthy conjunctiva, cornea, and lid margins; nerves that still have a fairly decent rim; and an orbital rim and cheek structure that allow for good ergonomics when using the loader. Figure 2 shows a recent patient example who had their ocular surface disease treated prior to XEN implantation for an optimal environment for success. Figure 2. 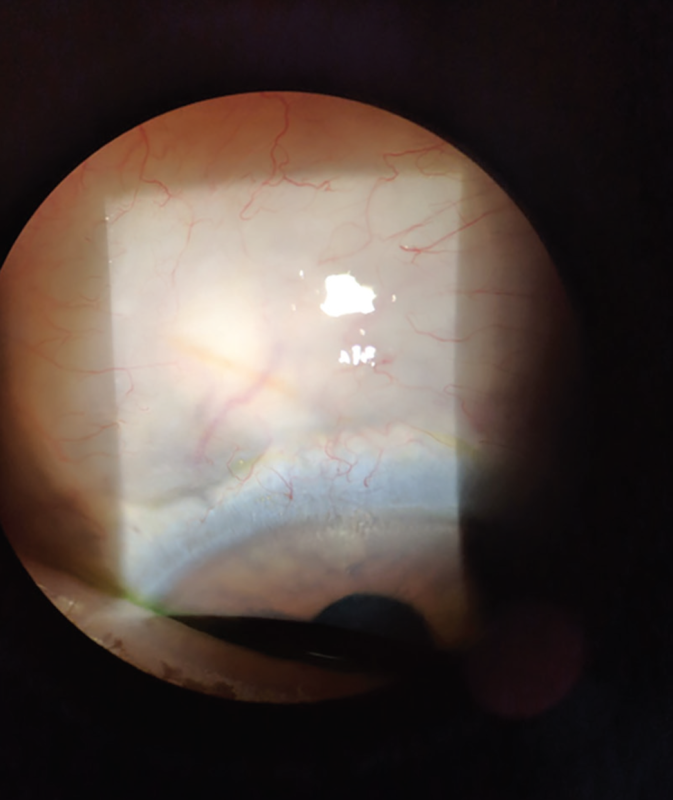 Treating ocular surface disease and meibomian gland dysfunction, such as in this patient, prior to implanting XEN are key to creating the optimal environment for success. Courtesy of Inder Paul Singh, MD. It is important with all procedures to set expectations with your patients. Tell them there is no perfect surgery, and there might be a need for additional surgery in the future. 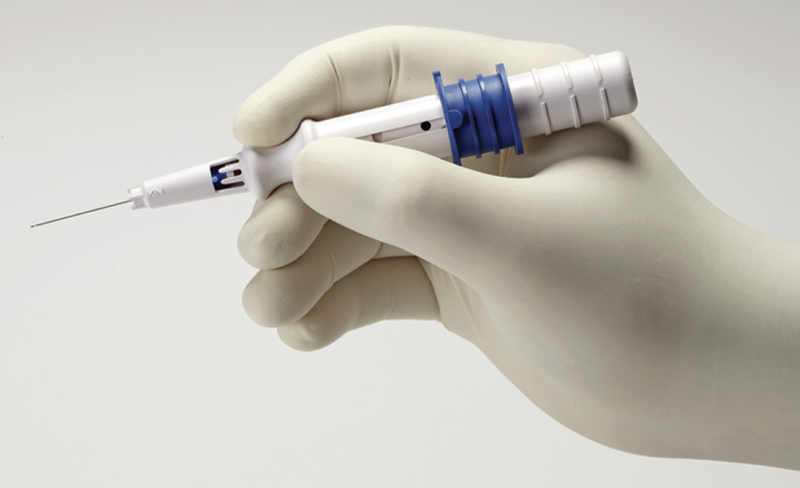 Since safety is established with XEN, it is an ideal option for refractory glaucoma patients. But if this treatment does not work, we have other procedures we can consider. I tell patients glaucoma is a chronic and progressive disease; it may take more treatments to manage properly. XEN does not inhibit the use of other procedures in the future if needed. Dr. Sheybani: Adopting a surgical procedure that is new to your practice always implies a learning curve. The complete instructions for XEN are in the Directions for Use1 and should be followed. Can you share additional pearls for inserting a XEN stent? Dr. Singh: It is a single-handed loader that is ergonomic (Figure 3). It is not necessary to turn the head or the scope. Gonioscopic guidance should be used to enter the trabecular meshwork to confirm that you engaged the angle at the correct level. When you see the needle come into the subconjunctival space, you can see the bleb right away. You have confirmation that you are in the right space. Figure 3. The XEN loader is a single-handed loader. Make sure you have good visualization, and where you make your incision is important. In patients with high cheekbones, do not make your incision too inferior because you will have a hard time getting the right angle since the loader will end up hitting the cheek and not allow for the correct angle of insertion. In some patients, I place a stay suture to bring the eye down into the right position. Do not be afraid to do that if necessary. Dr. Shamie: Beware of the lid margin and where the upper lid sits. You want to try to position the bleb beyond that edge so that if there is keratinization of the eyelid margin, it is not rubbing against the edge. Dr. Singh: In terms of the placement of the XEN stent, we try to be as supra-Tenon’s as possible, as subconjunctival as possible. Do not be afraid to aim more vertically to get the needle into the subconjunctival space; it really is very difficult to pierce through the conjunctiva and if one does, you can redirect to another area fairly easily. I also confirm the stent is freely mobile and will use a canula or a sponge to flick the stent back and forth. If it appears to be in Tenon’s, I will take a 27-gauge or 30-gauge needle to move the Tenon’s out of the way and free the stent. Often you will see a nice bleb start to form once you irrigate. At the end of the case, I also like to massage the bleb to spread fluid and allow for a more diffuse flow. Digital pressure should be avoided because of the potential for implant damage. Dr. Goldman: What has helped me to see the bevel nice and clearly is to use the pneumo-dissection technique with viscoelastic presented by Iqbal Ike K. Ahmed, MD, FRCSC, from the University of Toronto, Canada.6 It has given me confidence, and I now come through Tenon’s without curling the tube. Dr. Sheybani: What about incision size? I have found that if I make the incision too big, there is a lot of torque or I can get too much reflux of viscoelastic. Dr. Singh: I use a 2.0 blade. It is a perfect size and I still have enough fulcrum. Even if you are temporal with the incision, you can still use the inferior edge of the wound as a fulcrum, pivot the needle vertically, and insert the stent at the anterior 12 o’clock position. Dr. Sheybani: What are you using for anesthesia in a pseudophakic patient? Dr. Goldman: I recommend that surgeons initially perform the procedure using a retrobulbar block. Currently, I use topical anesthesia as I am more comfortable with the procedure. 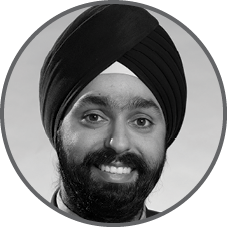 Dr. Singh: I use preservative-free intracameral lidocaine 1%, which has been sufficient. I do not give a subconjunctival lidocaine injection at all anymore. I have even had a few patients who were intolerant of anesthesia, so I performed the procedure with just topical anesthesia. You pierce through the scleral wall, and the patients do not feel it. Dr. Sheybani: We all agree that this is a procedure that needs to be done with adjuvant mitomycin C (MMC) or another antiscarring agent. Do you have any suggestions to alleviate any barriers to entry for surgeons who are apprehensive about using MMC? How do you source MMC? Dr. Goldman: For many surgeons, MMC brings flashbacks of residency and fears of cystic, avascular blebs, scleral melts, and other complications. Although those occurrences are possible, they are a very low risk with this ab interno approach. Consistency is the key to using it successfully. Develop a consistent protocol and plan it before you start; it becomes very facile. 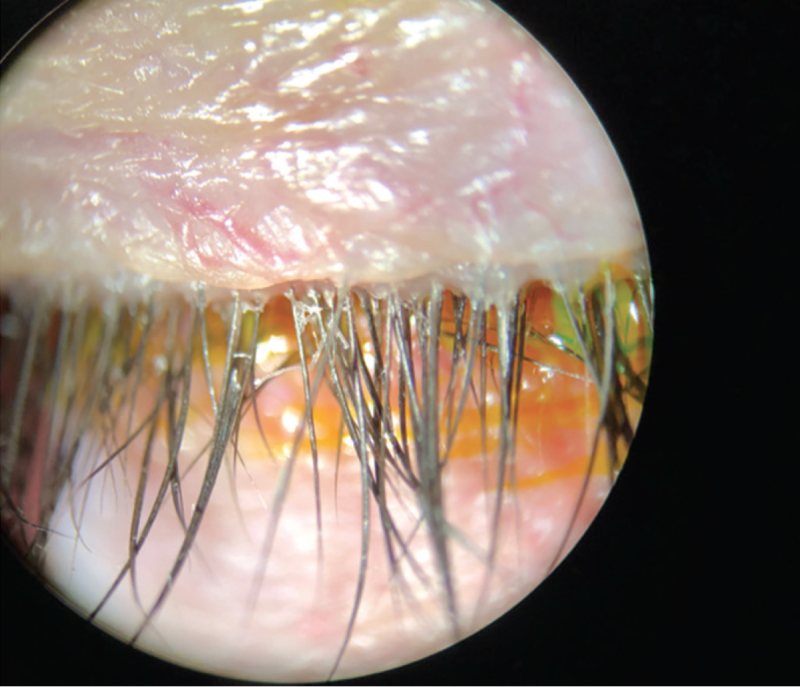 Dr. Sheybani: You want to see the whole bevel of the needle through the sclera, almost shiny but not quite exposed. Then you advance the lever forward, relax your hand, ensure the needle is fully retracted in the sleeve, then slowly pull back exactly perpendicular like you were. If you pull back too quickly, you can end up with too much of the tube in the anterior chamber. If that happens, how do you correct that? Dr. Shamie: An important surgical pearl is to consider the positions of your incision and your hand before you start, so that you are not torquing too much. If you find your incision placement is not ideal, and you place the inserter in the eye and feel that you are not comfortable, do not struggle. Take it out, take a breath, relax your shoulders, and make another incision if necessary. These are very small incisions; it is okay to make a second one. Dr. Singh: Before I even begin the case, I hold the loader and visualize how I will enter the eye. I check if I have good exposure and if not, I might move a little inferiorly or place a stay suture. I then determine exactly where I am going to make my incision. Once I see the stent in the subconjunctival space and the lever is almost fully advanced, I relax and flatten my hand position and then fully advance the lever. I then count 2 or 3 seconds before I pull the loader away. This ensures that the loader does not inadvertently pull the stent back into the anterior chamber. If that does happen, it is possible to take nontoothed forceps and pull the stent from the conjunctival side further into the subconjunctival space. If that is not possible or does not work, then take micro-forceps and pull the stent back out through the cornea and implant a replacement stent. Dr. Sheybani: The hold has to be comfortable. Curling at the tip is one way to see that the placement is not ideal; it may indicate some resistance. If the stent is poking at the conjunctiva, that is not good placement either. What do you do in that case? Dr. Goldman: When you examine the published data, the intraoperative complications are very minimal. The manipulations and time in the eye are minimal when the XEN stent is initially placed correctly. The most important aspect is to make sure you place the XEN stent correctly. If the bevel is not coming out of the right plane, pull back and insert elsewhere. If the tube fractures when you are placing it, pull it out and put another one in. If the tube is too short in the subconjunctival space, pull it out with nontoothed forceps. If the stent is too long in the anterior chamber, push it back in. It is much easier to take extra steps to make any necessary manipulations during the initial placement rather than at the slit lamp the next day. Do not leave the OR until you are confident that the stent is where you want it to be. Dr. Sheybani: The directive to have 1 mm of stent in the anterior chamber, 2 mm visible in the subconjunctival space, and the exit from the sclera approximately 3 mm from the limbus1 is a great target, but I do not aim for specific measurements. I want to see a free and mobile implant that is not overly short (Figure 4). Figure 4. Properly placed XEN exiting at 12 o’clock directed superonasally. Dr. Shamie: Take advantage of the training resources available, including a plethora of videos and the clinical specialists. Ask a colleague to attend a surgery. There are so many opportunities for training; there is no reason to struggle through the learning curve. Dr. Sheybani: Figure 5 shows the XEN Gel Stent visible under the conjunctiva postoperatively. This procedure provides significant IOP lowering. The pivotal data show IOP was reduced from a mean of 25.1 mm Hg to 15.9 mm Hg at 12 months and use of hypotensive medications was reduced from a mean of 3.5 to 1.7.7 The speed to visual recovery is excellent. What have your experiences been in terms of IOP outcomes and visual recovery? Figure 5. The Xen Gel Stent is straight and visible under the conjunctiva postoperatively. Dr. Goldman: I am impressed by the fact that when I add XEN to cataract surgery, I have seen no increase in intraocular inflammation. My patients have not had astigmatism from the bleb or refractive shift. Dr. Singh: Astigmatism can degrade vision, so when it is not induced, that is significant. Dr. Sheybani: When you are counseling patients on what to expect after XEN surgery, what kind of IOP lowering do you tell them to expect? Dr. Goldman: In my hands, my patients’ average postoperative pressures are around 12 to 13 mm Hg. Occasionally, a patient will have a postoperative IOP of 4 or 6 mm Hg on day 1, but they do not stay that low, and that is not the average. In my experience, the majority of my patients have good IOP on their first postoperative day, while maintaining their visual acuity. This means that I can still use it in my cataract patients who want a toric intraocular lens. Dr. Shamie: It is important to distinguish between numerical hypotony and prolonged hypotony that may be causing complications such as maculopathy. An IOP of 2 mm Hg should be monitored, but so long as it is for a brief period of time and without other pathology, it is manageable. In the XEN pivotal trial, 24.6% (16/65) of patients experienced transient hypotony (IOP < 6 mm Hg at any time), while 0% (0 of 65) of patients experienced persistent hypotony (IOP < 6 mm Hg at 2 visits > 30 days apart) or hypotony maculopathy. Dr. Sheybani: That is a good point, but can you explain why we even see those very low pressures? Dr. Singh: It is important to realize that these very low, initial pressures are self-limiting. Depending on the technique used, the surgeon essentially breaks the scleral wall into the subconjunctival space. If there is some side-to-side movement during this step, it may cause peritubular flow initially. This can cause very low initial pressures. However, the peritubular flow usually closes spontaneously, making it self-limiting. As Dr. Shamie stated, if you have an IOP of 4 mm Hg and if the chamber is deep and is stable without choroidals, then the surgeon should wait and monitor, as the IOP will rise. Dr. Sheybani: There seems to be a negative connotation around any procedure that creates a bleb. It is important that we recognize that not all blebs are the same, so this should not be an automatic stop factor for us. XEN creates an ab interno bleb that controls flow via a restricted lumen, leaving the Tenon’s capsule adhesions intact and creating a low-lying, undisturbed drainage space (Figure 6).8 Can you share your experiences with the XEN bleb? Figure 6. The XEN bleb is a very low-lying and diffuse bleb. Dr. Goldman: It is critical to distinguish that with the XEN bleb, you will rarely see bleb leaks, bleb dysesthesia, or foreign body sensation. Dr. Sheybani: Have you seen obstruction issues, and if so, how do you address them? Dr. Shamie: The key to bleb management is to not allow the scarring and fibrosis to last too long and make the bleb entirely flat. The sooner you clear an obstruction with needling, the better. Dr. Goldman: Prior to trying needling, it made me very nervous. I did not know what it entailed; the concept was out of my comfort zone and likely would have kept me from trying XEN. But it really is not what I originally thought. I recommend other surgeons watch videos and practice in a wet lab. It is not beyond the scope of a comprehensive surgeon. Adding back a medication is another option. 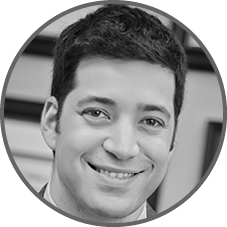 Dr. Sheybani: I tell my patients that the body’s natural response is to create scar tissue, and there is an approximately 30% chance that we may have to take an extra step in the office to make sure that the XEN stent works the best it can. If they have that expectation outright, and if follow-up needling is required, it is not alarming. Dr. Shamie: I think of needling as an opportunity to increase outflow when there is fibrosis. 1. XEN Directions for Use. 2. Sheybani A, Reitsamer H, Ahmed IIK. Fluid dynamics of a novel micro-fistula implant for the surgical treatment of glaucoma. Invest Ophthalmol Vis Sci. 2015;56:4789-4795. 3. Schlenker MB, Gulamhusein H, Conrad-Hengerer I, et al. Efficacy, safety and risk factors for failure of standalone ab interno gelatin microstent implantation versus standalone trabeculectomy. Ophthalmology. 2017;124(11):1579-1588. 4. Lewis RA. Ab interno approach to the subconjunctival space using a collagen glaucoma stent. J Cataract Refract Surg. 2014;40(8):1301-1306. 5. Mansouri K, Guidotti J, Rao HL, et al. Prospective evaluation of standalone XEN gel implant and combined phacoemulsification-XEN gel implant surgery 1-year results. J Glaucoma. 2017;27:140-147. 6. Ahmed I. Glaucoma surgery by Ike Ahmed – air XEN gel-stent placement. EyeChannel website. https://eyechannel.com.br/glaucoma-surgery-by-ike-ahmed-air-xen-gel-stent-placement/. Published June 1, 2018. Accessed October 25, 2018. 7. Grover DS, Flynn WJ, Bashford KP, et al. Performance and safety of a new ab interno gelatin stent in refractory glaucoma at 12 months. Am J Ophthalmol. 2017;183:25-36. 8. Dapena CL, Ros RC. Glaucoma-filtering surgery with a XEN collagen-based implant via the ab interno route. Revista Española de Glaucoma e Hipertensión Ocular. 2015;5(3):350-357. XEN® Gel Stent is contraindicated in angle-closure glaucoma where angle has not been surgically opened, previous glaucoma shunt/valve or conjunctival scarring/pathologies in the target quadrant, active inflammation, active iris neovascularization, anterior chamber intraocular lens, intraocular silicone oil, and vitreous in the anterior chamber. 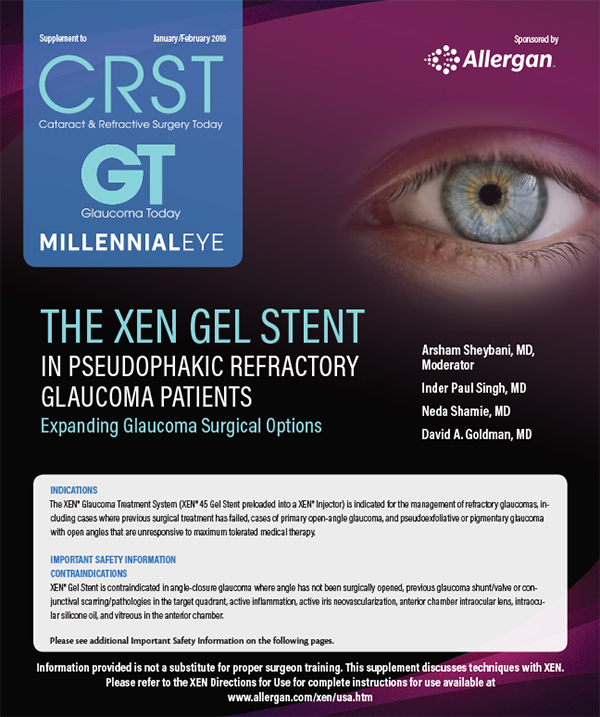 XEN® Gel Stent complications may include choroidal effusion, hyphema, hypotony, implant migration, implant exposure, wound leak, need for secondary surgical intervention, and intraocular surgery complications. Safety and effectiveness in neovascular, congenital, and infantile glaucoma has not been established. Avoid digital pressure following implantation of the XEN® Gel Stent to avoid the potential for implant damage. Examine the XEN® Gel Stent and XEN® Injector in the operating room prior to use. Monitor intraocular pressure (IOP) postoperatively and if not adequately maintained, manage appropriately. Stop the procedure immediately if increased resistance is observed during implantation and use a new XEN® system. Safety and effectiveness of more than a single implanted XEN® Gel Stent has not been studied. Caution: Federal law restricts this device to sale by or on the order of a licensed physician. For the full Directions for Use, please visit www.allergan.com/xen/usa.htm or call 1-800-678-1605. Please call 1-800-433-8871 to report an adverse event.